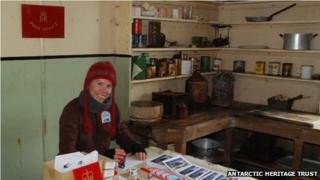 One of the world's most remote post offices has reopened in Antarctica, 54 years after it was abandoned. The Antarctic Heritage Trust reopened the Detaille Island office, to sell postcards and Antarctic stamps to fund restoration of the island's buildings. The trust's Anna Malaos, from Cambridge, will run it with two Welshmen - Michael Powell, from Crickhowell, and Tudor Morgan from Usk. Hundreds of tourists are expected to visit before it closes in a fortnight. The base at Detaille Island was built in 1956 for scientists surveying the Antarctic Peninsula. However, it was forced to close in 1959 when solid sea ice prevented it from being restocked for the season. The staff abandoned the base, taking only their personal possessions. Everything else was left behind. The Antarctic Heritage Trust hopes money raised by briefly reopening the post office will help it restore the buildings and contents. Rachel Morgan, the trust's director and Tudor's wife, said: "They are fragile and vulnerable but important for the glimpse they can give us into the daily lives of some of Antarctica's earliest scientists and explorers." Ms Malaos said it was an "honour to be a polar postmistress" and added: "It's a privilege to be able to reopen it after all this time and reconnect the building with the world." The office, which has no telephone or internet access, mains electricity or running water, will only be staffed when cruise ships visit the island. It will shut later this month when the Antarctic winter closes in. Working with the postmistress are Mr Powell and Mr Morgan, both of whom previously worked for the Cambridge-based British Antarctic survey. Mr Morgan was recently awarded the Polar Medal in the Queen's New Year's Honours list for his contribution to polar science during an 18-year Antarctic career. Letters and postcards sent from Detaille Island could take anything from three to seven weeks to reach the UK, as they have to be taken by ship to the Falkland Islands before entering the international mail system.